Instantly I’m transported back to the early 1990’s, and visiting a new client’s home for the first time. I stepped out of the car and there it was – golden lanterns shining in the grey hills light. I’ve loved them ever since……….thank you. Aren’t they beautiful? Despite my best intentions, I’m rarely out and about with my camera at dawn, but this was an exception, and the light added a little extra glow. 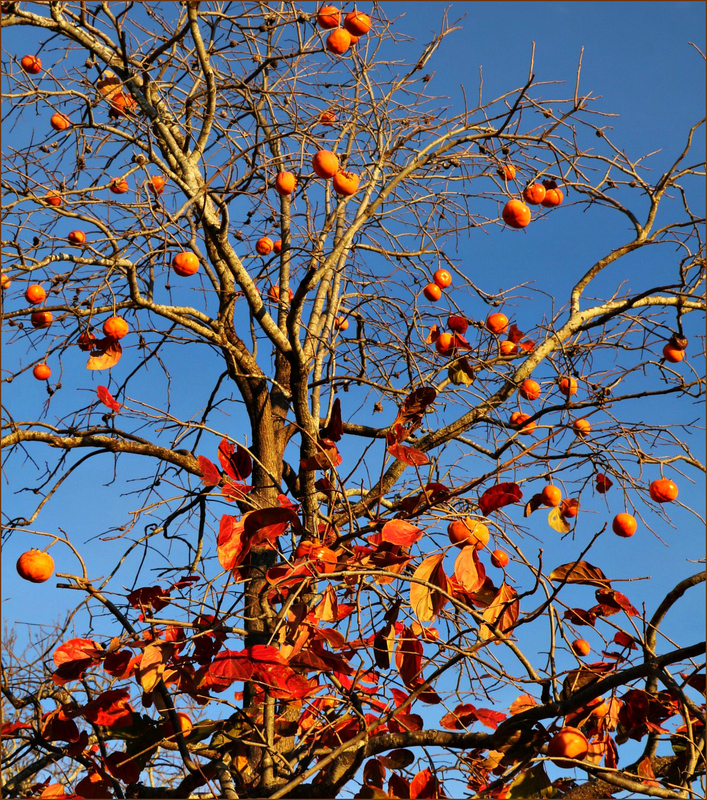 There’s a persimmon tree outside the Williams Sonoma store in our part of town that has borne fruit for several years. Eve fantasizes going there after closing time with a ladder. I like the play of the oranges and reds against the blue. There is a peculiar color to the sky in autumn, and I don’t know whether it’s because of the absence of green against it, or whether it’s due to some quality of the light perhaps caused by the angle of the earth’s axis relative to the sun at that time of year. The oranges and reds have a stark hardness which contrasts against the soft, almost velvet texture of the blue. I love the reds of autumn. So rich and dark. I don’t know if you are familiar with the work of Anne Bachelier, but she is very fond of that flaming orange shade, one of the reasons I like her work. You’re right about the blues of the autumn and winter skies. I’ve always thought of them as “thinning,” and assumed it had to do with the angle of the rays of the lowering sun. It’s noticeable enough that the change in the sky always has been my personal first sign of the changing season. That peculiar blue begins to arrive long before the migrating birds or the dropping leaves. No doubt the light itself is a signal to other parts of nature to get a move on. In any event, it is the perfect backdrop for the oranges, and reds of the season. Bachelier certainly explores the whole range of orange, and takes it far beyond jack-o-lanterns and candy corn. Ah….. persimmon. I love the ones which grow in NZ. I like to eat them when they are firm, like a firm, ripe papaya or melon. Even though I failed to identify the tree from the leaf, I was on the right track; I had considered crab apple, blueberry, quince, and medlar. I felt sure there was a fruit involved. I’ve never heard of the medlar. I know someone whose last name is Medlar, and never had considered that it might have other meanings. From your comment about the red leaf, I was sure you were considering a fruit. Are your persimmons astringent? The ones on this tree are, just slightly, and they’re best after a frost has softened them. Impatient persimmon lovers have been known to put a few in the freezer, allowing an artificial frost to speed up the ripening. I’d forgotten, until I read your link, that we have a native persimmon that also is black when it ripens. I’ve never seen one, nor tasted it, so my ignorance is nearly total. But at least I know it’s around. Like you, I’m not so fond of the soft persimmons. In a cake, or jam, they’re fine, but I’m not going to freeze the fruit to soften it, and then eat it with a spoon. My friend who owns this tree is delighted to have fruit still on it. In the past, everything from mockingbirds to raccoons to possums has worked at stripping the fruit. She’s not sure why there’s still some left, but thinks it may simply be the abundance. They had more rain than usual this year, and the trees bore heavily –so there was some for everyone. She’s already picked a good bit, and will have more: leaving the fruit at the top for the critters. The critters will be grateful. In 3 lines, an image appears. Brevity may be the soul of wit, but it also can hint at great beauty. Beautiful photo, beautiful fruit. I love persimmons, unfortunately for the past year or two persimmons haven’t loved me. Either I get a reaction to the tannin – even in ripe, entirely ready-to-eat fruit – or have developed an allergy to them. Other half is fine with them. It’s funny how those food sensitivities come and go. For years, I couldn’t eat cantaloupe or carrots. Now, they don’t bother me at all. I’ve wondered whether persimmons would have bothered me, too, if I’d tried them back in the days when canteloupe and carrots were problematic. The color suggests “yes,” but I never made an effort to find out if it was the carotene that was the issue. It would be lovely if your sensitivity would disappear, too. Mmm, yes it would! Generally though, once I’ve got a food intolerance,it stays. My worst one is to potatoes as I’m sensitive to the whole edible-nightshade family. Vivid reminders that it is nearly time to begin baking persimmon cakes. I will soon find baskets of them on my porch, left by a friend glad to find someone to use them. It never had occurred to me that persimmons might land on doorsteps like zucchnni at the height of their season. Lucky you, to have such a neighbor, and lucky neighbors, who no doubt profit from your baking! I think they might be one of those fruits, like figs, that are best when ripened on the tree — meaning they don’t often show up in grocery stores. At least, I don’t remember seeing them there. On the other hand, those things that pass for “vine-ripened” tomatoes are everywhere, so I suppose they might be around. But you’re right. The color is very much like a tangerine, and they look so pretty on the tree. I was happy to have a blue sky the morning I was in this tree’s neighborhood. I thought, really I did that it might be a persimmon. I drive to Mexia to Lightsy farms about 3-4 times each fall to get persimmons which I dehydrate and or freeze. I have bought about eight one half bushels of Fuyu and Hichiya (sp). I love the Asian persimmons and these two varieties are my favorites. I still have about 30 fruit to put in freezer bags. I eat persimmons with frozen blueberries and soy milk. I will also make lots of fruit rolls which are made in the dehydrator. I eat for my health but also because the fruit is a good substitute for craving chocolate. If persimmons can help a person deal with chocolate cravings, perhaps I should pay more attention. I’ve never known someone who puts up persimmons in bulk. The friend who has this tree will freeze them, but only because the fruit is there. I pick peaches, blackberries, and blueberries at our local farms, but I’ve never seen anyone advertising persimmons. I’m wondering if they even grow down here. They may not. Now that I know which varieties you enjoy, I’ll watch for them in the stores. They might be at places like Whole Foods, but we don’t have those stores available. I’d have to drive into Houston to check one out. Maybe I should do that the next time I’m in town, just so I can see what all the excitement’s about. I may be the last person on earth who’s never been in a Whole Foods store. Lightsy Farms goes to Ft Worth, Austin and I think Houston as well. I will let you know in the Fall if you remind me. Or I’ll try to remember to call over there before next fall. They sell persimmons mainly to an Asian population but my friend now is onto to them because I gave her a few and now she is addicted to them too. Buying them in stores is like buying gold. Very expensive and I could not even begin to buy two of them, I pay thirty dollars for a half bushel. I think they grow near the gulf. They love sandy soil but my sister when on the farm, grew the hichaya (sp) in black land clay. I suppose it depends on the variety. As it happens, I was driving home from the wildlife refuge yesterday when I noticed I’d crossed Persimmon Bayou: how about that? A little search turned up this fellow, whose persimmon orchard is in New Caney, north of Houston. He lives in Lake Jackson, which I pass through from time to time. I guess that answers the question of whether persimmons grow around here. Now, I just need to keep track of his activities. I saw the very brief mention of fruit sales on his page. I’ll have to find out about that. I have a source for Satsumas and Myer lemons, but it would be fun to see what else he offers. Persimmon Bayou, well now that is a coincidence. I made the link of the fruit man a favorite so that maybe one day I’ll make it to his place. You really should find out when he is selling persimmons at New Caney. If you don’t like or love the persimmon I’d be very surprised. The season for persimmons is over here but maybe it is still going in your area. Never had one, so I will try to imagine that taste that can ring a bell. Of course, unless one has truly tasted something, imagining it is impossible despite a thousand words painting a picture of the flavor. OTOH, as a window treatment installer and working with upholstered furniture, I have often come across the color. Our sky has been that blue a few times lately but, alas, no persimmons to contrast. At least you’ve had some blue skies, which has to be a pleasure. Besides, you have orange (and red and yellow) leafed trees. I think of our persimmons and berries as consolation prizes. I’m not at all fond of Halloween orange, but persimmon is a pleasing color, and it does shine on a tree. You’re right about the difficulty of describing tastes. Words like “sweet” and “salty” evoke past experiences, but they’re too general to really pin a taste down. I’ve been sitting here trying to decide how to describe the taste of a persimmon, and I can’t. You’ll just have to find one and try it! I gave myself extra points for getting up and about in time to photograph it at sunrise. With a photo like this as motivation, I might start giving sunrise as much attention as sunset. It really was a thrilling sight — one of those that deserved a photo, just for the sake of memory. Not everyone is. I do enjoy the cakes and jam my friend makes, but I’m not going to be standing around the kitchen with a persimmon in one hand and a spoon in the other. Of course, I’ve been ignorant of the varieties, and it may be that I’d enjoy the sweeter ones. Since I’ve only had fruit from this tree, I may be missing something. I was glad not to miss this photo opportunity, though. When I talked with my friend last night, she said nearly every leaf has fallen — and a good bit more of the fruit is missing, thanks to her nighttime raiders. As interesting as your backyard (and front yard, and side yards) are, I’d keep the camera handy, too. We all profit by it! Squirrels are funny, period. We’ve got a cold front coming, and their activity level is, shall we say, increasing. Your last comment cracked me up, Curt. Robert Herrick meets Bob Dylan — I never would have imagined that one! SUCH a wonderful little haiku – and you would think the photo had been made with that in mind, or vice versa. A perfect pairing. A commenter on the previous photo of the leaf had mentioned its Japanese “feel,” and that sent me looking for more information on the importance of the persimmon in Japanese culture. That’s how I found the haiku, which seemed exactly right. It was interesting to read three different translations of the haiku, and to see how even slight variations in wording can make such a difference. I thought this one especially nice; I’m glad you liked it. I haven’t heard the bells in Japan in person, but we had a very nice, smaller temple bell when I lived at a monastery in NY. Ringing it was the best! Couldn’t resist – here’s a nice recording. I did just read through the article you linked. It was interesting, although I sometimes am unsure how much is being “read out” of a haiku and how much is being “read in.” It’s another reminder that artistic forms are embedded in particular cultures, and can’t be fully understood apart from them, with all their nuances. At least, that seems so to me. I laughed out loud at the first comment appended to the video — someone asking if there wasn’t a video with the bell but without all the darned birds. One man’s meditation is another’s pure annoyance, apparently. I do love bells of all sorts, especially change-ringing. It’s not as contemplative as a temple bell, but it’s certainly enjoyable. One New Year’s Eve in NYC I went with friends to a watchnight service at Riverside, and the midnight bells were splendid. So many haiku Westerners write depend solely on syllable counting, and miss the nuances, the focus on the natural world, the sudden shift in perspective, and so on. There’s much I don’t understand about the form, but I recognize when I’ve managed to honor it. It isn’t a common occurrence. We had quite the discussion at Trader Joe’s about buying persimmon seeds for the salad. Since I was buying and since they weren’t inexpensive, we gave it a pass, but I always think of Persephone (I think). It’s a lovely tree! I remembered Persephone being associated with pomegranate seeds, but when I double-checked my memory, I see that persimmon seeds also have been part of the story. I’d never heard of using persimmon seeds — although pomegranate seeds in fruit salads are pretty common — but apparently that’s a “thing” these days. When I read about how few there are in each fruit, and what they have to be processed, a higher price makes sense. I also learned that persimmon seeds are used as a weather predictor. Just so you know, the persimmons are saying colder and snowier for the east coast this year. I’m not sure what they say for your area! This and your last photo absolutely filled me with joy! I think it’s the color play, but also the clarity of the subjects. And bells do resound when the taste of persimmon hits the tongue! I’m so glad they resonated, Tina — like that bell that announces, “Persimmon!” I was thrilled to have a perfectly calm morning and clear skies to take the photos. If this had been the only pair of photos that turned out that weekend, it would have been enough. We don’t have persimmons here but I remember them from the south; and all of the animal life that loved them. And “all the animal life” is just the right phrase. My friend whose tree this is can list them all: raccoon, possum, squirrel, various birds, ring-tail cat, deer, skunks, and coyote. Her outside cats will tuck into one from time to time, but they’re not so fond of them, and usually persuade themselves to leave the fruit for someone else.